Kumana described his trip on one of the American ship was a wonderful and peaceful. He said, since he lost his beloved wife he felt emotionally and have frequent flash backs which he cannot avoid. He also mentioned that he loves the Americans and with their presence he felt comfort and have new feelings while on the one day trip on the boat. He said, the trip was different from other events. Previous events Americans like more information's regarding the rescue of JFKennedy . He said, this trip is peaceful which gave him comfort. He thanked Hon Danny Kennedy (Local American Business man) for organizing the peaceful trip.And the captain of the ship for his hospitality on boat. Aaron Kumana also mentioned his 5 recommendations (proposal) to the J.F. Kennedy Family for considering his proposal. As a grandson of Aaron Kumana, I myself also understand that Kumana is the only elder in the community, tribe and the church. He is well respected, not only that, he is identified as the source of improving the community. These beliefs came about during his requests to visitors and the promises he made for helping his community. Kumana will never give up and will keep trying to fulfil these promises. 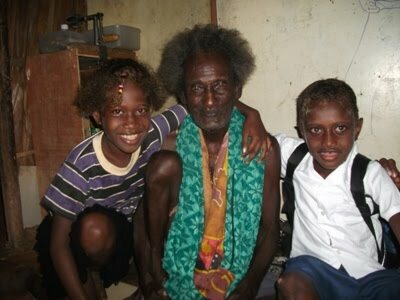 Picture above: Kumana with Grandchildren after a day trip on boat.